Happy Halloween! 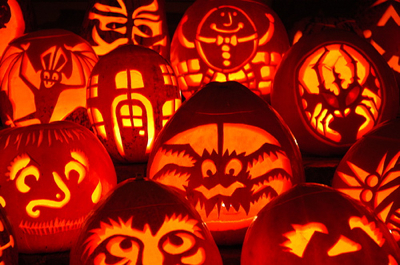 It's a time for costumes, spooks, candy, and branding lessons for small businesses. That's right, a time to take a look at what business branding lessons we can learn from Halloween characters. Take a guess at which character best represents an issue your brand is facing. Frankenstein - It's Alive! But your brand is frightening to look at. You've, by some product of science and madness, created a brand out of various parts, images, and ideas. You have a functioning website, product, and images but they are all inconsistent. One look at all of your messaging and imaging together could make a designer shreek. What makes you scary - There is no consistency. People don't know what to expect from you. There is good inside of you but your audience is too busy screaming and running the other way through the village. Not to mention an even scarier thought, bouncing off your website. Until you put a coherent, consistent brand in front of them, they will never be able to relate to your brand. Ghost - Is your brand real or not? We just don't know. Sure, it could be fun and friendly but it's unseen. And it's unlikely a late night paranormal TV program will go out searching for your brand. What makes you scary - Are you even there? Your audience can't see you. If they can't see you, they won't be able to use your product or service - no matter how awesome. If you have a brand, get it out there! Be seen. Mummy - You're looking pretty good for 5,000 years old...but you don't look much younger than that. You have a well established brand that has recognition. Those old bandages have gotten you this far, why change? What makes you scary - Your brand hasn't changed since the start. Brands need to evolve as your organization and customers do. It's a fast paced world where brands can rise and fall. Make sure your brand is staying true to who you are but keeping up with the times. Skeleton - There's not much to your brand. You could say it's bare to the bones. It's about as plain and basic as it can be. People know of your brand but nothing makes you unique. What makes you scary - You're boring. Nothing makes you memorable. Your business has something unique to offer, so show that. Adding some depth to your brand can go a long way. Werewolf - You seem to be a normal human being but when the the full moon hits, you're anything but. Don't be something you're not. What makes you scary - Customers trusted you and now you're something completely different. You will struggle to build customer loyalty when you can't deliver on what you promised. Make sure you brand image and messaging align with what you deliver. Now this is all in fun but these are some real issues many business brands face. Whether you're a mom and pop shop that's been around for decades, a young startup or a mature business, branding matters. This guest article was written by Nate Holmes of Smartimage.